Thanks to Mohamad Al karbi for giving me this opportunity to share something about Jordanian’s cuisine. Sending him a special thanks for his kind support and cooperation in allowing me to guest post in his blog. Once again, thank you for being supportive, Mohamad Al karbi!! This post concerned about Jordanians’ cuisine, If you’re a food lover, this is a list of food you’ve got to try when you’re in Jordan. 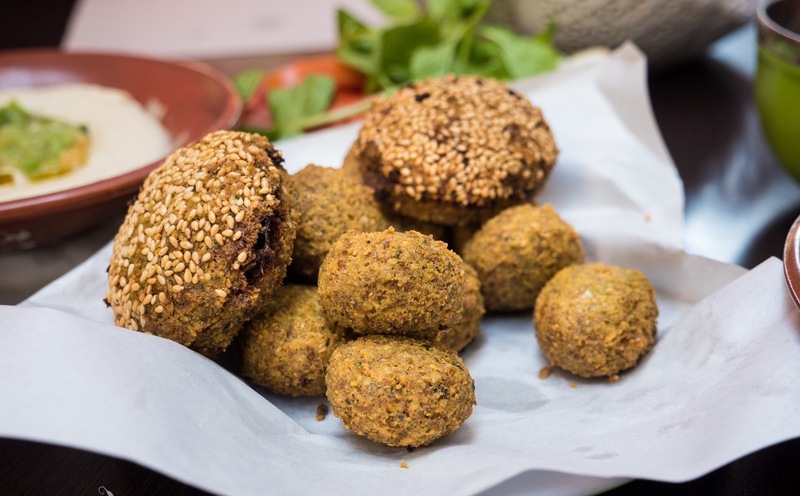 Falafel, a combination of ground chickpeas, mixed with a variety of spices, then deep fried into mini patty like shapes, is one of the most common street food snacks or light meals in Jordan. They can be eaten on their own like veggie nuggets, eaten with bread, or stuffed into sandwiches. When you plan to visit Jordan, you will find a type of baba ghanoush dish , it is a kind of Middle Eastern roasted eggplant dip and you will love it. 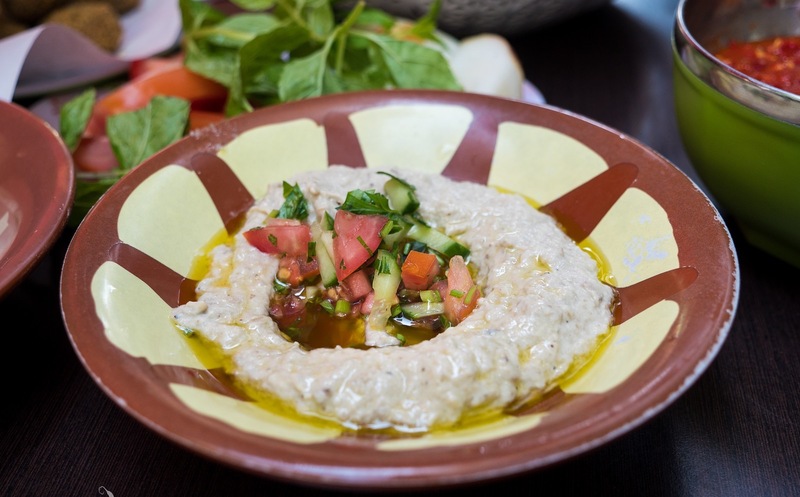 When you visit Jordan, you will discover that baba ghanoush is available everywhere, by far the more common roasted eggplant dip available is moutabel, which is similar to baba ghanoush, but quite different. One of the main ingredient differences is that moutabel uses yoghurt in its recipe. You will love eggplant, especially when it’s roasted over fire, to give it a wonderfully smoky taste and a smooth and creamy consistency. For moutabel, the roasted and peeled eggplant is combined with yoghurt, tahini, garlic and lemon juice. 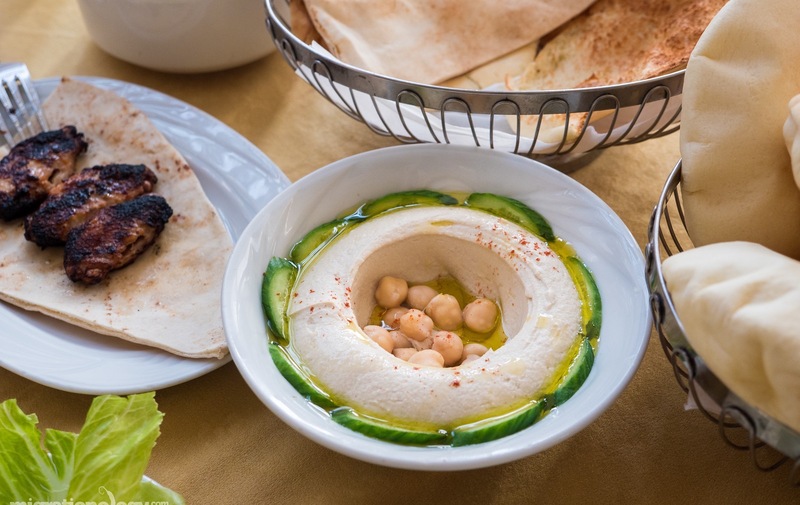 Hummus is possibly the most well known Levantine and Middle Eastern food around the world. You will enjoy hummus. And In Jordan we ate hummus mostly everyday and it is preferred in the morning, and evening time as well. The hummus in Jordan is fantastic, and despite containing just about the same ingredient make-up at every restaurant you order it from, it’s amazing how each version tasted just slightly different – the amount of lemon juice, and ratio of garbanzo beans to tahini, the texture, and also, very importantly, the olive oil. 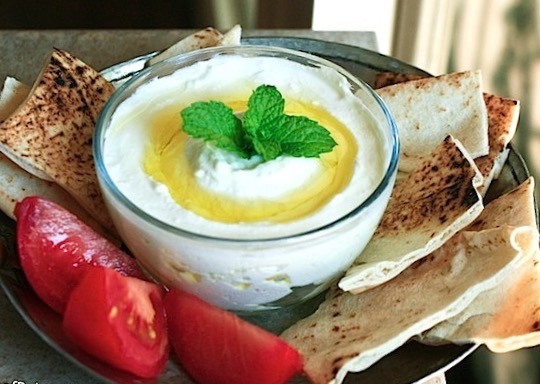 Labneh, which is also known as strained yoghurt, is a very thick, creamy yoghurt, that’s served at just about every breakfast table in Jordan. It’s not typically eaten like a bowl of yoghurt because it’s so rich, but instead it’s used as a spread for bread, or a dip for vegetables. The taste is sour and creamy, but usually not salty, very similar to sour cream. Labneh can be served in a bowl plain, or drizzled with olive oil, or combined with different herbs or leaves to give it more flavor. 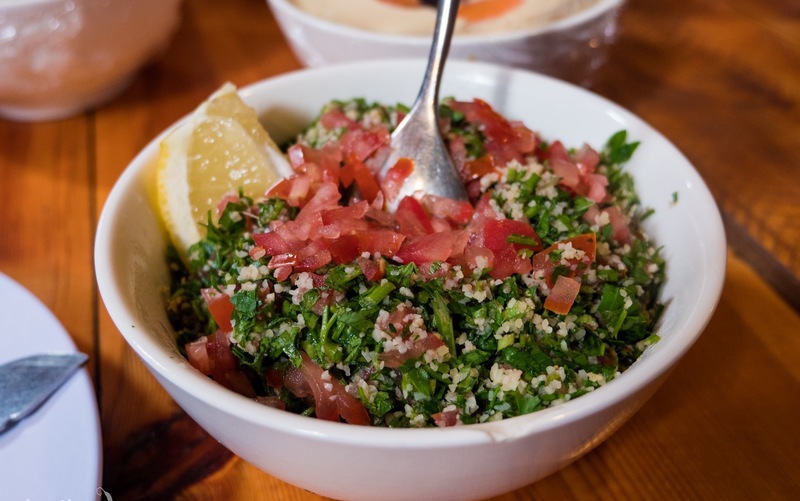 Another Levantine dish, often a starter or salad, tabbouleh is a mixture of finely minced parsley, tomatoes, garlic, and bulgar wheat, all dressed in lemon juice, salt, and olive oil. And also, tabbouleh is not typically scooped up with bread like hummus or moutabel, but it’s typically eaten plain with a spoon as well. As for tabbouleh. You will love the freshness and crispness of the parsley, the garlicky taste, and the contrast of sour lemon juice and saltiness. As it is available all over Jordan. 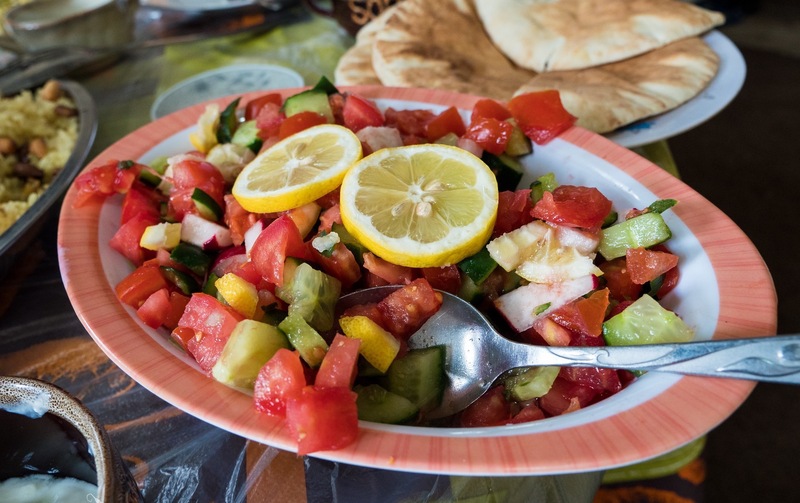 Similar in dressing taste to tabbouleh, but with a different vegetable make-up, Jordanian, or Arabic salad, usually includes finely diced up cucumber, tomatoes, and bell peppers, dressed in lemon juice and lots of olive oil. We eat this salad as an excellent refreshing starter dish, we also particularly enjoyed it with main dishes like maqluba (rice and meat) and with grilled dishes like shish kebabs – to give the meal a nice balance. Nearly every restaurant in Jordan, they serve it. This entry was posted in Around the World and tagged Food, Jordan on December 22, 2017 by Hussein Allam. I like to read various genres of books such as philosophy, psychology. My favorite Quote is " No Pain, No Gain" as I believe that the more pain we get , the more comfortable we get. However, my blog shows part of life lessons, I relate to it through my past experience. It all looks so yummy to me, Hussein. I love falafels and hummus but there are some other dishes I would like to try. Thank you Hussein, I appreciate your thoughts and prayers. Some of my favorite foods in the world are listed here. Falafel, hummus and my beloved Tabbouleh. I just want to sit down and have a Jordanian feast!! Lovely, healthy-looking food choices. Hope I get to try them sometime. Thanks for sharing. The food looks very tasty and healthy. I will love to try the Labneh and Hummus. Thanks for sharing.